Can "Field Loadable Software" be delivered with an EASA Form 1 and is an EASA Form 1 required for installation? First of all it should be clear that the definition of "parts and appliances" (Refer to article 3 of the Basic Regulation) includes software. This is software that is installed in an aircraft and used in operating or controlling that aircraft. The rest of this response only refers to this type of software. the installation is approved. (Refer to 21A.303). In order to achieve 1) and 2), the organisation that manufactures and releases the software must meet the requirements of Subpart F or G from Part-21. This means in particular that the software must be part of the scope of that production organisation and there must be a link between the design organisation and the production organisation. it is part of design data for which approval has been applied or granted; and. it is produced by, and within the scope of a production organisation that meets the requirements of Subpart F or G.
Marking of this Field Loadable Software must be in accordance with Subpart Q of Part-21. For practical reasons the marking could be on the software "container" (e.g. the CD carrying the software). What is the definition of "Critical parts"? The term "critical part" or "critical component" is used in various EASA requirements, certification specifications and also in the EU-US bilateral, however it is not always defined. CS 27-29-VLR.602(a): A critical part is a part, the failure of which could have a catastrophic effect upon the rotorcraft, and for which critical characteristics have been identified which must be controlled to ensure the required level of integrity. CS-E.510(c) It is recognised that the probability of Primary Failures of certain single elements cannot be sensibly estimated in numerical terms. If the Failure of such elements is likely to result in Hazardous Engine Effects, reliance must be placed on meeting the prescribed integrity specifications of CS-E 515 (Engine critical parts) in order to support the objective of an Extremely Remote probability of Failure. A "Critical component" means a part identified as critical by the design approval holder during the product type validation process, or otherwise by the exporting authority. Typically, such components include parts for which a replacement time, inspection interval, or related procedure is specified in the Airworthiness Limitations section or certification maintenance requirements of the manufacturer's maintenance manual or Instructions for Continued Airworthiness. Each of the above definitions should be used only within their own context and for their own purpose i.e. the definition of the bilateral is only relevant for the automatic acceptance of PMA parts and repair design from the US. Where the term "critical part" is not defined the dictionary meaning of "critical" should be used i.e. crucial, decisive, important, etc. For the application of Part 21A.805 critical parts are those identified as such by the design approval holder, which for rotorcraft, engines, propellers and APUs as a minimum should be those using the definitions of the relevant CS. What is the mandate of the Agency for Environmental issues? What does the Agency concretely do? Article 6 of the Basic Regulation transposes into Community law the International standards of the International Civil Aviation Organisation (ICAO) related to the environmental certification of aeronautical products. The Agency is involved, together with the Commission, in the further development of such standards to ensure that they do take into account Community objectives in this field. Another important task of the Agency is to verify that the design of products comply with environmental requirements. The Agency shall therefore establish and notify the appropriate environmental requirements for each product for which environmental certification is required and issue the appropriate environmental certificates. Such powers are established by articles 20(d) and (h) respectively of the Basic Regulation and further detailed in Part 21.A.18 "Designation of applicable environmental protection requirements and certification specifications" of Commission Regulation (EC) No 1702/2003. Design Approval: FAA Supplementary Type Certificates (STC) approved by National Aviation Authorities (NAAs) before 28-09-03 are deemed to be approved by EASA. If the NAA has limited the approval in scope compared to the original FAA STC such that it does not cover all the models, how can we apply for an extension of the scope? Because Agency ED Decision 2004/04/CF automatically approves minor changes and major level 2 changes to FAA STCs when made by the STC holder on his own STC, the scope of the EASA STC is considered to be the same as the scope of the original FAA STC. Therefore there is no need for an application and the STC can be applied to all models listed on the FAA STC. Why and how must Parts and Appliances be marked, when are the letters EPA required, and which exceptions are acceptable? To comply with EASA Part-21, Subpart D, 21.A.109, Subpart E, 21A.118A (b) and Subpart M, 21A.451(a) and (b), it is the obligation of the respective Holders of a Minor Change Approval, a STC, or a Major Repair Design Approval, to specify the required markings, including EPA letters as applicable, in their Design (read, ‘Approved Data’), according EASA Part-21, Subpart Q.
Subpart Q, 21.A.804(a), and related GM, require proper identification of each Part and Appliance that is designed or redesigned, including parts designed to be incorporated in repairs (21A.451), by ‘permanent and legible marking’ hereof, and is applicable for Design Organisations and Manufacturers. 21.A.804(a) 1 and 2 clearly require marking of Parts and Appliances with ‘name, trademark, or symbol identifying the Manufacturer’ and ‘Part number’, as defined in the applicable Design Data. According to the GM the Design Approval Holder shall identify in all its Design (TC, STC, ETSO, Repair, Change) approved after 28 December 2009, how the Manufacturer has to mark subject Parts and Appliances in accordance with 21A.804(a) 1; which can be limited to identifying a marking field and the method, without prescribing the actual text or symbols. 21.A.804(a) 3 requires additionally marking with the letters ‘EPA’ of all parts produced (manufactured) in accordance with data ‘not belonging to the TC holder of the related product’. Each interchangeable or removable Part or Appliance that is manufactured in accordance with a design issued by the Design Organisation, shall be permanently and legibly marked according to 21.A.804. The EPA marking was introduced in 2004; this was done to clearly identify any ‘not original’ Part, (which means any Part or Appliance not designed by the TC- or ETSO- Approval Holder), as a trigger for Maintenance Organisations and Accident or Incident investigators, in the light of Continuing Airworthiness. The intention was certainly not to require adding of the letters ‘EPA’ to mark repairs. In this context, EPA marking only applies to the new designed and manufactured parts to be incorporated in the repair. Especially where repairs have an impact on interchangeability, identification of incorporated new Parts is very important, and DO Procedures should address this item. The only accepted exception with regard to Marking (including EPA), is defined in 21.A.804(b). This subparagraph offers the possibility to not physically mark the Part of Appliance, when it is too small or when marking hereof is otherwise impractical, but only after “Agency agreement”. This wording allows an Applicant/Holder of a Design and the Agency to further define in detail how this ‘agreement’ can be obtained and will be formalised. DOATL should however ensure that the DOA Applicant/Holder reflects this approach in its DO Handbook or Procedures, requiring at least a justification of the reason for not marking physically, and details of the alternative way chosen for the identification, in accordance with 21A.804(b), to know on the authorised release document accompanying the Part or Appliance, or on its container. The Agency has concluded after a thorough review that the current Basic Regulation and Part 21 do not provide for the approval of manufacturers of raw materials. Only organisations responsible for the manufacturing and subsequent release of a 'product' and 'parts and appliances' as defined in the Basic Regulation Article 3 (c) and (d) are required to hold a POA and are therefore eligible to apply for such an approval. ED Decision 2007/012/R introduced an amendment to AMC/GM to Part-21 bringing all AMC and GM to Part 21 back into line with the EC Regulations regarding this issue and thus removing any ambiguity. Should parts fabricated under a maintenance approval (Part 145) be marked with an EPA (European Part Approval) marking in accordance with Part 21A.804(a)(3)? A Part 145 approved organisation can only fabricate parts for its own use in accordance with approved design data (145.A.42(c)). If that data comes from the Type Certificate holder; 21A.804(a)(3) would not be applicable and those parts will not need EPA marking. If the data comes from a Supplemental Type Certificate holder, minor change approval holder or repair approval holder, the parts will have to be marked as prescribed in the applicable data which should include an EPA marking since 28/3/2004. EASA STC’s being presented for approval when the pre-mod configuration is not EASA approved. What are EASA changes embedded in Non-EASA approved design? 21.A.101 and 21.A.103 require that the changed product meets the applicable certification basis. Therefore the change for which EASA has received an application needs to be demonstrated compliant to the EASA certification basis on product level. It is not sufficient to demonstrate compliance on change level only. The change, applied for EASA approval, must include all affected parts of the non-approved change that builds the interface to the EASA approved product and all affected compliance demonstration (influences on the product and the non-approved interface change). 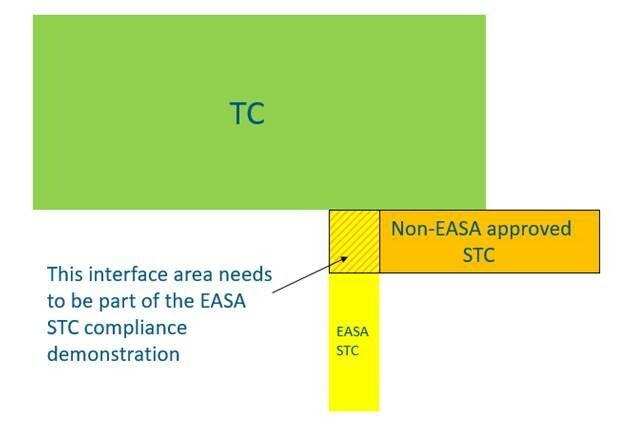 A limitation is likely to be necessary that the STC cannot be installed on an EASA registered product as long as the interface change is not yet EASA approved. How can I find one particular AMC-20 in the published AMC-20 amendments? The table below indicates in which amendment one particular AMC-20 was published. Follow the link to access the AMC-20 amendments.